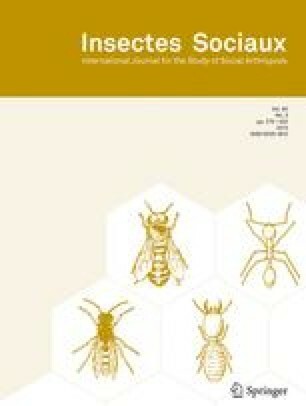 Two subspecies of honeybees, Apis mellifera capensis and A. m. scutellata provide an ideal model to test for the significance of reproductive workers in natural populations of honeybees. Laying workers of A.m.capensis parthenogenetically produce female offspring (thelytoky) whereas workers of the other subspecies produce male offspring (arrhenotoky). By using a two allele marker system in both the mitochondrial (mt) and in the nuclear (nuc) DNA, a deterministic population genetical model shows that through the differences in laying worker reproduction alone, clines of the mt and the nuc marker should be shifted. The stronger the impact of laying workers the further should the capensis mt type introgress into the scutellata population. The theoretical model is supported by empirical data from the hybrid zone between the two subspecies. The nuc hybrid zone begins 200 km south of the mt hybrid zone indicating a significant impact of the laying workers on colony reproduction. Key words: Worker reproduction, mitochondrial DNA, nuclear DNA, genetic diversity, Apis mellifera, hybrid zone. Received 30 October 1997; accepted 28 January 1998.